A combat sport, or fighting sport, is a competitive contact sport that usually involves one-on-one combat. In many combat sports, a contestant wins by scoring more points than the opponent or by disabling the opponent. Common combat sports include mixed martial arts, boxing, wrestling, fencing, savate, kickboxing, Muay Thai, Sanda, Tae Kwon Do, Capoeira, Brazilian Jiu-jitsu, HMB, Sambo, Kyokushin, and Kūdō, sometimes even Ninjutsu. 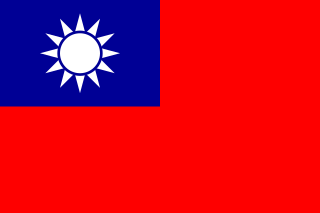 During the early 20th century, various mixed-style contests took place throughout Japan, Taiwan, and in the countries of the Four Asian Tigers. In Brazil, there was the sport of Vale Tudo, in which fighters from various styles fought with little to no rules. 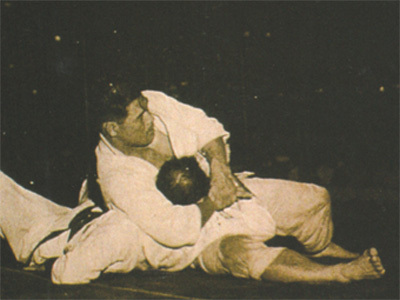 The Gracie family was known to promote Vale Tudo matches as a way to promote their own Brazilian Jiu-Jitsu style. An early high-profile mixed martial arts bout was Masahiko Kimura vs. Hélio Gracie in 1951, fought between judoka Masahiko Kimura and Brazilian jiu jitsu founder Hélio Gracie in Brazil. In the West, the concept of combining elements of multiple martial arts was popularized by Bruce Lee's Jeet Kune Do during the late 1960s to early 1970s. 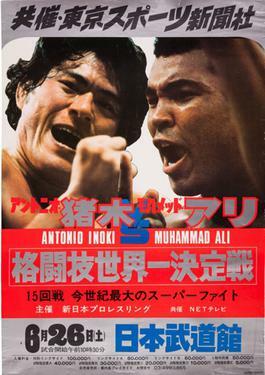 A precursor to modern MMA was the 1976 Muhammad Ali vs. Antonio Inoki bout, fought between boxer Muhammad Ali and wrestler Antonio Inoki in Japan, where it later inspired the foundation of Pancrase in 1993 and Pride Fighting Championships in 1997. CV Productions, Inc., is a Pittsburgh, Pennsylvania-based mixed martial arts company, founded in 1979. It is considered the first MMA based company in the United States and responsible for creating the blueprint for modern mixed martial arts competition. The company promoted the first regulated league of mixed martial arts style competitions beginning in 1980 with the intention of creating a new mainstream sport. The league events pitted combatants from all fighting disciplines including boxers, kick boxers, martial artists, wrestlers, grapplers, and all around “tough guys.” Competitors could win by opponent’s submission, knockout or judges' decision. The competitions were promoted as “Anything Goes - striking, throwing, grappling, punching, kicking, ground fighting, and more.” The shows were immediately dubbed by the media as “Organized, Legalized, Street Fighting,” a phrase coined by KDKA TV's Dave Durian. Most rule sets for mixed martial arts competitions have evolved since the early days of vale tudo. As the knowledge about fighting techniques spread among fighters and spectators, it became clear that the original minimalist rule systems needed to be amended. As rules evolved and regulations added, different branches of mixed martial arts have emerged, with differences between the different rulesets dictating different strategies. Similarly, shoot wrestling organizations, such as Shooto, expanded their rulesets to integrate elements of vale tudo into their sport. However, for the most part, fighters accustomed to one rule set can easily acclimate to the others. Pay-per-view (PPV) is a type of pay television service by which a viewer can purchase events to view via private telecast. The broadcaster shows the event at the same time to everyone ordering it. 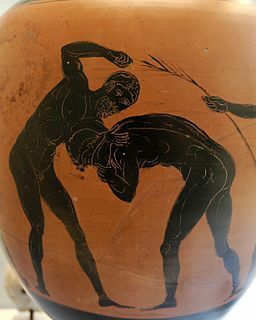 Pankration was a sporting event introduced into the Greek Olympic Games in 648 BC and was an empty-hand submission sport with scarcely any rules. The athletes used boxing and wrestling techniques, but also others, such as kicking and holds, locks and chokes on the ground. The only things not acceptable were biting and gouging out the opponent's eyes. Chinese martial arts, often named under the umbrella terms kung fu and wushu, are the several hundred fighting styles that have developed over the centuries in China. These fighting styles are often classified according to common traits, identified as "families", "sects" or "schools" of martial arts. Examples of such traits include Shaolinquan (少林拳) physical exercises involving Five Animals (五形) mimicry, or training methods inspired by Old Chinese philosophies, religions and legends. Styles that focus on qi manipulation are called internal, while others that concentrate on improving muscle and cardiovascular fitness are called "external". Geographical association, as in northern and "southern", is another popular classification method. Indian martial arts refers to the fighting systems of the Indian subcontinent. A variety of terms are used for the English phrases “Indian martial arts”, usually deriving from Dravidian sources. While they may seem to imply specific disciplines, by Classical times they were used generically for all fighting systems. In February 12, 1963, three karatekas from Oyama dojo (kyokushin later) went to the Lumpinee Boxing Stadium in Thailand and fought against three Muay Thai fighters. The three kyokushin karate fighters were Tadashi Nakamura, Kenji Kurosaki and Akio Fujihira (also known as Noboru Osawa), while the Muay Thai team of three had only one authentic Thai fighter. 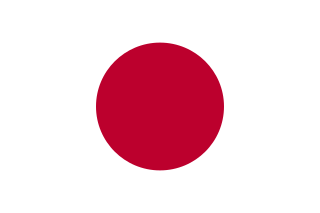 Japan won 2–1: Tadashi Nakamura and Akio Fujihira both knocked out their opponents with punches while Kenji Kurosaki, who fought the Thai, was knocked out by elbows. It should be noted that the Japanese fighter who lost, Kenji Kurosaki, was a kyokushin instructor, rather than a contender, and that he had stood in as a substitute for the absent chosen fighter. In June of the same year, karateka and future kickboxer Tadashi Sawamura faced top Thai fighter Samarn Sor Adisorn: Sawamura was knocked down sixteen times on his way to defeat. Sawamura went on to incorporate what he learned in that fight in kickboxing tournaments. A contemporary of Bruce Lee, Wing Chun practitioner Wong Shun Leung, gained prominence fighting in 60-100 illegal beimo fights against other Chinese martial artists of various styles. Wong also fought and won against Western fighters of other combat styles, such as his match against a Russian boxer named Giko,  his televised fight against a fencer,  and his well-documented fight against Taiwanese Kung-Fu master Wu Ming Jeet. Wong combined boxing and kickboxing into his kung fu, as Bruce Lee did. Vale tudo began in the 1920s and became gained renown through its association with the "Gracie challenge", which was issued by Carlos Gracie and Hélio Gracie and upheld later by descendants of the Gracie family. The "Gracie Challenges" were held in the garages and gyms of the Gracie family members. When the popularity grew, these types of mixed bouts were a staple attraction at the carnivals in Brazil. Early mixed-match martial arts professional wrestling bouts in Japan (known as Ishu Kakutōgi Sen (異種格闘技戦), literally "heterogeneous combat sports bouts") became popular with Antonio Inoki only in the 1970s. Inoki was a disciple of Rikidōzan, but also of Karl Gotch, who trained numerous Japanese wrestlers in catch wrestling. The first state regulated MMA event was held in Biloxi, Mississippi on August 23, 1996 with the sanctioning of IFC's Mayhem in Mississippi  show by the Mississippi Athletic Commission under William Lyons. The rules used were an adaptation of the kickboxing rules already accepted by most state athletic commissions. These modified kickboxing rules allowed for take downs and ground fighting and did away with rounds, although they did allow for fighters to be stood up by the referee and restarted if there was no action on the ground. These rules were the first in modern MMA to define fouls, fighting surfaces and the use of the cage. In March 1997, the Iowa Athletic Commission officially sanctioned Battlecade Extreme Fighting under a modified form of its existing rules for Shootfighting. These rules created the three 5 minute round, one-minute break format, and mandated shootfighting gloves, as well as weight classes, for the first time. Illegal blows were listed as groin strikes, head butting, biting, eye gouging, hair pulling, striking an opponent with an elbow while the opponent is on the mat, kidney strikes, and striking the back of the head with closed fist. Holding onto the ring or cage for any reason was defined as a foul. While there are minor differences between these and the final Unified Rules, notably regarding elbow strikes, the Iowa rules allowed mixed martial arts promoters to conduct essentially modern events legally, anywhere in the state. On March 28, 1997, Extreme Fighting 4 was held under these rules, making it the first show conducted under a version of the modern rules. Since the UFC came to prominence in mainstream media in 2006, and with their 2007 merger with Pride FC and purchases of WEC and Strikeforce, no companies have presented significant competition,  and the UFC is regarded as having most of the top ranked talent. Fighters usually get contracts in the UFC after competing successfully in other MMA promotions from around the world. Some MMA promotions tend to exist more to build up prospects while others have a good mix of prospects and veterans. Some exist only to be feeder leagues to the bigger promotions (e.g. LFA, CWFC),  others exist to try to be the best in the world (e.g. ACB, ONE Championship). Some promotions only do four shows a year while others are doing them monthly. The high profile of modern MMA promotions such as UFC and Pride has fostered an accelerated development of the sport. The early 1990s saw a wide variety of traditional styles competing in the sport. However, early competition saw varying levels of success among disparate styles. In the early 1990s, practitioners of grappling based styles such as Brazilian jiu-jitsu dominated competition in the United States. Practitioners of striking based arts such as boxing, kickboxing, and karate, who were unfamiliar with submission grappling, proved to be unprepared to deal with its submission techniques. As competitions became more and more common, those with a base in striking arts became more competitive as they cross-trained in styles based around takedowns and submission holds. Likewise, those from the varying grappling styles added striking techniques to their arsenal. This increase of cross-training resulted in fighters becoming increasingly multidimensional and well-rounded in their skill-sets. MMA Weekly: Ranks top 10 male fighters worldwide in every possible division, and P4P for female fighters. Also used by Yahoo! Sports. According to the Unified Rules of Mixed Martial Arts, an MMA competition or exhibition may be held in a ring or a fenced area. The fenced area can be round or have at least six sides. Cages vary: some replace the metal fencing with a net, others have a different shape from an octagon, as the term "the Octagon" is trademarked by the UFC (though the 8-sided shape itself is not trademarked). The fenced area is called a cage generically, or a hexagon, an octagon or an octagon cage, depending on the shape. Stand-up : Boxing, Kickboxing, Muay Thai, Karate, Taekwondo, Capoeira, Combat Sambo, Savate, and Wushu Sanshou are trained to improve stand-up striking. Clinch : Judo, Freestyle and Greco-Roman wrestling, Sambo, and Wushu Sanshou are trained to improve clinching, takedowns and throws, while Muay Thai is trained to improve the striking aspect of the clinch. Ground : Brazilian Jiu-Jitsu, Judo, Sambo, Catch wrestling and submission grappling are trained to improve ground control and position, as well as to achieve submission holds, and defend against them. Boxing is a combat form that is widely used in MMA and is one of the primary striking bases for many fighters. Boxing punches account for the vast majority of strikes during the stand up portion of a bout and also account for the largest number of significant strikes, knock downs and KOs in MMA matches. Several aspects of boxing are extremely valuable such as footwork, combinations, and defensive techniques like slips, head movement and stance (including chin protection and keeping hands up) commonly known as the Guard position. Boxing-based fighters have also been shown to throw and land a higher volume of strikes when compared with other striking bases, at a rate of 3.88 per minute with 9.64 per minute thrown (compared with Muay Thai at 3.46 and 7.50, respectively). Fighters known for using boxing include Cain Velasquez, Nick Diaz, Junior dos Santos, B.J. Penn, Dan Hardy, Shane Carwin and Andrei Arlovski. Muay Thai or Thai boxing and kickboxing, along with boxing, are recognised as a foundation for striking in mixed martial arts, and are both widely practiced and taught. Although both may seem identical, each has different techniques. Muay Thai originated in Thailand, and is known as the "art of eight limbs", which refers to the use of the legs, knees, elbows and fists. One of the primary benefits of training in Muay Thai for MMA is its versatility. Techniques cover the long, middle and short range with everything from kicks to clinch holds and throws. Meanwhile, kickboxing is a group of stand-up combat martial arts based on kicking and punching. The modern style originated in Japan and is developed from Karate and Muay Thai. Different governing bodies apply different rules, such as allowing the use of elbows, knees, clinching or throws, etc. Notable fighters who use Muay Thai include former UFC women's strawweight champion Joanna Jedrzejczyk, UFC Welterweight Darren Till and former UFC champions Anderson Silva and José Aldo. Sambo is a Russian martial art, combat sport and self-defense system. It is a mixture of Judo and Freestyle Wrestling using a Keikogi known as Kurtka. Sambo focuses on throwing, takedowns, grappling, and includes submissions from Judo and Catch Wrestling. Sambo also has a modality known as Combat Sambo, which adds punches, kicks, elbows and knees, making it a proto-MMA hybrid fighting style. Sambo is popular in Russia and eastern Europe, where it is taught as a complement to Judo and Wrestling training, Sambo also provides a good base for MMA with all-around skills for combining grappling and striking. Some notable Sambo fighters that transitioned into MMA include: Fedor Emelianenko, Igor Vovchanchyn, Oleg Taktarov and Khabib Nurmagomedov. In the United States, prior to the success of The Ultimate Fighter reality show that launched mixed martial arts into the mainstream media,[ citation needed ] there was no major coverage of female competitions. Some early organizations who invited women to compete included, International Fighting Championships, SuperBrawl, King of the Cage, Rage in the Cage, Ring of Combat, Bas Rutten Invitational, and HOOKnSHOOT. From the mid-2000s, more coverage came when organizations such as Strikeforce, EliteXC, Bellator Fighting Championships, and Shark Fights invited women to compete. Amateur Mixed Martial Arts is the amateur version of the Mixed Martial Arts in which participants engage largely or entirely without remuneration. Under the International Mixed Martial Arts Federation (IMMAF) and World MMA Association (WMMAA), it is practiced within a safe and regulated environment which relies on a fair and objective scoring system and competition procedures similar to those in force in the professional Mixed Martial Arts rules. Amateur MMA is practiced with board shorts and with approved protection gear that includes shin protectors, and amateur MMA gloves. World Mixed Martial Arts Association (WMMAA) was founded in 2012 in Monaco by M-1 Global commercial promoters and is under the leadership of the General Secretary Alexander Endelgarth, President Finkelstein and Fedor Emelianenko. The World MMA Association is an organization that manages and develops mixed martial arts, it establishes rules and procedures and hosts MMA competitions. World MMA Association includes national MMA organizations, representing the sport and registered in accordance with national laws. MMA in Australia is permitted in all States and Territories of Australia by various combat sports authorities and organizations. There is debate about the use of the cage, which was banned in Victoria in 2007  and then relegalized in 2015. The cage was banned in Western Australia in March, 2013. For many years, professional MMA competitions were illegal in Canada. Section 83(2) of the Canadian Criminal Code deemed that only boxing matches where only fists are used are considered legal. However most provinces regulated it by a provincial athletic commission (skirting S. 83(2) by classifying MMA as "mixed boxing"),  such as the provinces of Manitoba, Ontario,  Nova Scotia, Quebec, and Northwest Territories. The legality of MMA in the provinces of Alberta, British Columbia, and New Brunswick varies depending on the municipality. Professional MMA competitions remain illegal in the Canadian provinces of Newfoundland and Labrador, Prince Edward Island, Saskatchewan, Yukon, and Nunavut because it is not regulated by an athletic commission. In 2011, the Ranik Ultimate Fighting Federation (RUFF) hosted the first MMA event in Shanghai sanctioned by China's governing body for combat sports, the Wushu Sports Management Center of the General Administration of Sport in China. RUFF formally crowned the first Chinese national MMA champions in 2013 with each champion receiving 1,000,000 RMB in prize money. Other MMA promotions in China include the 'Real Fight Championship', which has produced three events in Henan and Beijing. There remains political opposition to MMA in France and full contact MMA competition is banned. All bouts on French soil recorded as Mixed Martial Arts are in fact held under Pancrase Rules and other variants (Pankration, Kempo, Pankido). These bouts involve no striking on the ground as it is illegal in the country. The Commission National de Mixed Martial Arts (CNMMA) was founded as a non-profit organization for the development of MMA in 2009. The CNMMA had worked over four years to put an educational structure in place, including a technical system for the safe progression from grass-roots level, all the way up to the top professional level. Comprising 11 regional leagues working under regional technical advisers and teams,  the CNMMA joined the International Mixed Martial Arts Federation (IMMAF) in March 2013 as The Commission Française de Mixed Martial Arts (CFMMA). In 2012, CFMMA president Bertrand Amoussou ascended to the position of President of the International Mixed Martial Arts Federation. Ministry of Youth Affairs and Sports (India) has not recognized Mixed Martial Arts as a sport in India. But the sport is growing fast and the Sports Ministry has given direct permission to host events to the biggest and oldest MMA Organization in the country - the All India Mixed Martial Arts Association (AIMMAA). AIMMAA is also the sole representative of the Global Mixed Martial Arts Federation in India. The Irish Martial Arts Commission, which is recognized by the Irish Sports Council, does not include MMA among its recognized martial arts. The Department of Transport, Tourism and Sport does not recognise MMA as a sport. [ not in citation given ] UFC Fight Night 46, featuring Conor McGregor, was held in Dublin in 2014. In 2012, the Sports Authority of Thailand banned competitions. It has been speculated that the Muay Thai industry played a factor in the Sports Authority of Thailand (SAT)'s final decision, as MMA could potentially take away business from Muay Thai. SAT Deputy Governor Sakol Wannapong has said "Organizing a MMA event here would hurt the image of Muay Thai, if you want to do this kind of business, you should do it in another country. Organizing MMA here could mislead the public into believing that Muay Thai is brutal." Jussi Saloranta, the owner of Thailand's only MMA promotion, DARE Fight Sports, revealed that his lawyers found that the ban was actually premature, and that from a legal standpoint, there is no law banning mixed martial arts in the country, suggesting that the SAT's ban was more of a scare tactic. DARE continue to showcase events, informing fans only at the last minute through texts on the day of the event, and presenting the videos on YouTube as The Most Dangerous Gameshow. Saloranta has also helped set up the MMA Association of Thailand, in the hopes of reaching a compromise with SAT and regulating mixed martial arts in Thailand. 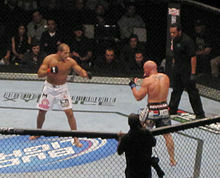 Wikimedia Commons has media related to Mixed martial arts . Sanshou , also known as Sanda , Chinese boxing or Chinese kickboxing, is a Chinese self-defense system and combat sport. Wushu Sanshou is a martial art which was originally developed by the Chinese military based upon the study and practices of traditional Kung fu and modern combat fighting techniques; it combines full-contact kickboxing, which includes close range and rapid successive punches and kicks, with wrestling, takedowns, throws, sweeps, kick catches, and in some competitions, even elbow and knee strikes. Shoot wrestling is a combat sport that has its origins in Japan's professional wrestling circuit of the 1970s. Professional wrestlers of that era attempted to use more realistic or even "full contact" moves in their matches to increase their excitement. The name "shoot wrestling" comes from the professional wrestling term "shoot", which refers to any unscripted occurrence within a scripted wrestling event. Prior to the emergence of the current sport of shoot wrestling, the term was commonly used in the professional wrestling business, particularly in the United Kingdom, as a synonym for the sport of catch wrestling. Shoot wrestling can be used to describe a range of hybrid fighting systems such as shootfighting, shoot boxing and the styles of mixed martial arts done in the Shooto, Pancrase and RINGS promotions. The Brazilian Top Team (BTT) is an academy specialized in Brazilian Jiu Jitsu and mixed martial arts. It established in April 2000 by Murilo Bustamante, Ricardo Libório, Mário Sperry and Luis Roberto Duarte, former members of the Carlson Gracie Academy, to develop and create new training techniques for Brazilian Jiu Jitsu, submission grappling and mixed martial arts. Maurice L. Smith is a retired American kickboxer and mixed martial artist. In kickboxing, he held the WKC world light heavyweight championship, the WKA world heavyweight championship, and the ISKA world heavyweight championship. In mixed martial arts, he held the Heavyweight championship in Battlecade Extreme Fighting and the UFC, and became a member of the UFC Hall of Fame in 2017. A professional competitor since 1980, Smith has formerly competed in kickboxing for the companies All Japan Enterprise and K-1, Pancrase, RINGS, PRIDE, Strikeforce, International Fight League and RFA. Clinch fighting is the part of stand-up fighting where the combatants are grappling in a clinch, typically using clinch holds. Clinching the opponent can be used to eliminate the opponent's effective usage of some kicks, punches, and melee weapons. The clinch can also be used as a medium to switch from stand-up fighting to ground fighting by using takedowns, throws or sweeps. Hybrid martial arts, also known as hybrid fighting systems or sometimes eclectic martial arts or freestyle fighting, refer to martial arts or fighting systems that incorporate techniques and theories from several particular martial arts (eclecticism). While numerous martial arts borrow or adapt from other arts and to some extent could be considered hybrids, a hybrid martial art emphasizes its disparate origins. 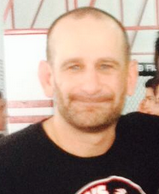 Greg Jackson is an American mixed martial arts (MMA) trainer who co-owns Jackson Wink MMA Academy in Albuquerque, New Mexico, widely considered one of the top MMA training centers in the world. Jackson has trained many successful fighters, including current UFC Light Heavyweight Champion Jon Jones, former UFC Welterweight/Middleweight Champion Georges St-Pierre, former UFC Women's Bantamweight Champion Holly Holm, former Light Heavyweight Champion Rashad Evans, and a roster of other UFC contenders and World Extreme Cagefighting champions. The Minnesota Martial Arts Academy is a martial arts training center in Brooklyn Center, Minnesota. It was founded in 1992 by Greg Nelson, a former NCAA Division 1 wrestler at the University of Minnesota. UFC 2009 Undisputed is a mixed martial arts video game featuring Ultimate Fighting Championship properties and fighters developed by Yuke's and published by THQ. The game was released for PlayStation 3 and Xbox 360. It is the first game to be released under THQ's 2007 agreement with the UFC, and it is to be the first UFC game released since UFC: Sudden Impact in 2004. A playable demo of UFC 2009 was released onto Xbox Live and PlayStation Network on 23 April 2009, and featured a tutorial and exhibition matchup between Chuck Liddell and Mauricio Rua. A sequel, UFC Undisputed 2010 was released on 25 May 2010. Mark Holst is a Canadian mixed martial artist from Ottawa, Ontario, who has fought in the UFC. He is currently training and teaching Muay Thai, BJJ and MMA at the Ottawa Academy of Martial Arts (OAMA) in Ottawa, Ontario, Canada. Reuben Duran is an American professional mixed martial artist currently competing in the Flyweight division. A professional since 2006, he has competed for the UFC, Shooto, and King of the Cage. He is the current King of the Cage Light Flyweight Champion, as well as the former Interim Flyweight Champion. Bertrand Amoussou-Guenou is a retired French mixed martial artist and judoka. He is a trainer for his younger brother Karl of Team Amoussou and, following official recognition of mixed martial arts in France, became the president of the national sanctioning body, the Commission National de Mixed Martial Arts, in January 2008. On 1 October 2013, Amoussou assumed the position of president of the International Mixed Martial Arts Federation (IMMAF). Alliance MMA Inc. is a mixed martial arts organization offering promotional opportunities for aspiring fighters to showcase their talent and advance to further professional competitions. Alliance MMA's mission is to identify and develop the next generation of Ultimate Fighting Championship (UFC) and other leading MMA promotion champions including The World Series of Fighting and Bellator. Mixed martial arts (MMA) has developed in Australia from a wide cross-section of sporting and martial arts disciplines to become the most popular combat sport in Australia. 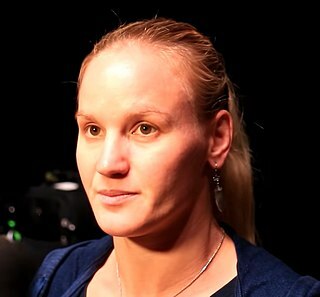 Valentina Shevchenko is a Kyrgyzstani–Peruvian professional mixed martial artist and former Muay Thai fighter. Shevchenko competes in the women's flyweight division of the Ultimate Fighting Championship (UFC), where she is the current Women's Flyweight champion. She became champion at UFC 231 beating Joanna Jędrzejczyk, who Shevchenko also previously beat three times in amateur Muay Thai bouts. The International Mixed Martial Arts Federation (IMMAF) was founded on 29 February 2012 as the international governing body for amateur Mixed Martial Arts (MMA). Registered as a non-profit organisation under Swedish law, IMMAF serves as a democratic hub for national MMA federations and supports the growth of regulation and sport safety globally by aiding countries in the formation of federations where none exist. IMMAF launched with support of market leader, the Ultimate Fighting Championship (UFC). The UFC is among promotions sanctioned by federations under the IMMAF umbrella in countries that include Brazil and Sweden. Jack Slack is a pen name of an anonymous English freelance writer, analyst and amateur historian of combat sport; most notable as a mixed martial arts (MMA) striking analyst, writing detailed, analytical breakdowns of fighters, fighting techniques and strategies, using videos, photos and animated GIFs. 1 2 Rosenberg, Howard (November 15, 1993). "'Ultimate' Fight Lives Up to Name". Los Angeles Times. Archived from the original on November 6, 2011. Retrieved June 22, 2016. ↑ Rosenberg, Howard. "Full Contact! presents - A UFC 1 Article". Archived from the original on 3 February 1998. 1 2 Kirik Jenness (2012-02-04). "Did LA reporter coin the term Mixed Martial Arts?". Mixed Martial Arts News. Archived from the original on 2014-10-17. Retrieved 2014-06-08. 1 2 Grant, T.P. "History of Jiu-Jitsu: Coming to America and the Birth of the UFC". Archived from the original on 2012-10-11. Retrieved 2018-05-07. ↑ Sonmez, Can. "UFC 1: The Beginning". Mixed Martial Arts.com. Archived from the original on 2013-09-28. Retrieved 2013-09-26. ↑ Plotz, David (November 16, 1997). "Fight Clubbed". Slate . Archived from the original on December 31, 2006. Retrieved December 26, 2006. ↑ McFarland, Matt (May 6, 2008). "Ultimate Fighting wants to come to NY". WNYT.com. Archived from the original on 2008-05-09. Retrieved 2008-05-06. ↑ Trembow, Ivan (March 1, 2007). "UFC PPV Revenue Tops $200 Million in 2006". MMA Weekly. Archived from the original on May 22, 2007. Retrieved 2007-06-18. ↑ Brownell, Susan Elaine (1990). The olympic movement on its way into Chinese culture. University of California, Santa Barbara. pp. 29, 63. Archived from the original on 2018-05-13. Retrieved 2018-05-13. 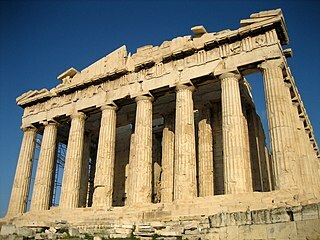 In both ancient China and Greece, the most popular sports were probably wrestling, boxing, and combinations thereof (Greek pankration, Chinese leitai). 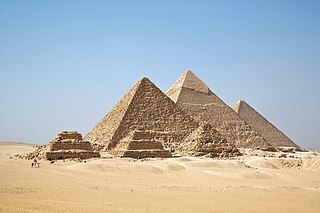 The same might be argued for ancient Egypt, India and Japan. [...] In both ancient China and Greece, the no-holds-barred combat sport (Greek pankration, Chinese leitai) was probably the most popular one. 1 2 3 Green, Thomas A. Martial Arts of the World [2 volumes]: An Encyclopedia of History and Innovation. ABC-CLIO (June 11, 2010). pp. 259-260. ISBN 978-1598842432. ↑ Graeme Kent (1968). A Pictorial History of Wrestling. Spring Books; 1 edition. 1 2 Noble, Graham (March 2001). "An Introduction to E. W. Barton-Wright (1860–1951) and the Eclectic Art of Bartitsu". Journal of Manly Arts. Archived from the original on 2007-08-18. Retrieved 2007-06-14. ↑ "Journal of Combative Sport: Jujitsu versus Boxing". Journal of Combative Sport. Archived from the original on 2008-07-20. Retrieved 2008-05-07. ↑ "Fighting Spirit: An Introductory History of Korean Boxing, 1926–1945". Journal of Combative Sport. Archived from the original on 2009-02-25. Retrieved 2009-02-16. ↑ "MMA Fan's Guide to Grappling: Sambo". Bloody Elbow. Archived from the original on 2014-02-01. Retrieved 2014-02-07. ↑ Adams, Andy (2013-03-22). "Classic Black Belt Article From 1967: Russia Prepares to Export Sambo (Part 2) – - Black Belt". Blackbeltmag.com. Archived from the original on 2014-01-12. Retrieved 2014-02-07. 1 2 Willoughby, David P. (1970). The Super Athletes. A.S. Barnes & Co., Inc. pp. 376–380. ISBN 0-498-06651-7. ↑ Roberto Pedreira (February 16, 2015). Choque: The Untold Story of Jiu-Jitsu in Brazil Volume 2, 1950-1960 (History of Jiu-Jitsu in Brazil 1856-1999). Clube de Autores. ISBN 978-1505487169. ↑ Peterson, D.: Wong Shun Leung: The Legend behind the Legend; Recalling the life of Bruce Lee's teacher Archived 2016-03-03 at the Wayback Machine Retrieved on 25 June 2009. ↑ Lam, G., & LeBlanc, G. E.: The Wing Chun double knife training: Baat Jaam Do Archived 2012-02-17 at the Wayback Machine Retrieved on 7 July 2009. ↑ Longley, K.: Dave Lacey 'Lai Dai Wai': Buck Sing Choy Lay Fut's unrepentant 'Black Panther' Archived 2016-03-04 at the Wayback Machine (originally published in Impact International Martial Arts Magazine). Retrieved 7 July 2009. ↑ Bull, Andy (2009-11-11). "The forgotten story of ... Muhammad Ali v Antonio Inoki". The Guardian. Archived from the original on 2015-12-26. Retrieved 2014-06-08. ↑ Gross, Josh (2016). Ali vs. Inoki: The Forgotten Fight That Inspired Mixed Martial Arts and Launched Sports Entertainment. BenBella Books. ISBN 9781942952190. ↑ "What role did boxer Muhammad Ali play in early MMA? Let 'Ali vs. Inoki' author Josh Gross explain". MMAjunkie . June 13, 2016. Archived from the original on September 16, 2016. Retrieved September 4, 2016. ↑ Grant, T. P. (May 2, 2013). "MMA Origins: Fighting For Pride". BloodyElbow. Archived from the original on March 24, 2016. Retrieved September 4, 2016. ↑ Black Belt Apr 1999 (Rick Roufus interview - mentions fight). books.google.co.uk. Archived from the original on 2016-05-13. Retrieved 2011-06-06. ↑ "MMA Origins: Vale Tudo and The Original MMA Rivalry". Bloody Elbow. 2012-01-01. Archived from the original on 2014-08-22. Retrieved 2014-06-08. ↑ "MMA History, myths, facts, rumorsPittsburgh MMA". Archived from the original on 2014-09-03. Retrieved 2014-08-31. ↑ Sánchez Garcia, R.; D. Malcolm (2010). "Decivilizing, civilizing or informalizing? The international development of mixed martial arts". International Review for the Sociology of Sport. 45 (1): 39–58. doi:10.1177/1012690209352392. Archived from the original on 2016-02-08. Retrieved 2014-03-15. ↑ "Fight Finder – UFC 1 The Beginning". Sherdog.com. Archived from the original on 2008-04-20. Retrieved 2008-05-05. ↑ Peligro, Kid (2003). The Gracie Way: An Illustrated History of the World's Greatest Martial Arts Family. Invisible Cities Press. pp. 79–84. ISBN 1-931229-28-7. ↑ "What is MMA (Mixed Martial Arts)?". Allout Fight Shop. Archived from the original on 2014-03-15. ↑ "What is Pride?". Pride. Archived from the original on 2007-02-02. Retrieved 2006-12-23. ↑ Sievert, Steve (December 29, 2006). "UFC 66 to make MMA history". Houston Chronicle. Archived from the original on January 14, 2009. Retrieved June 18, 2007. ↑ Doyle, Dave (April 4, 2000). "UFC scores TKO on its business rival". Fox Sports, MSN. Archived from the original on April 6, 2007. Retrieved 2007-03-27. ↑ Umstead, R. Thomas (September 18, 1995). 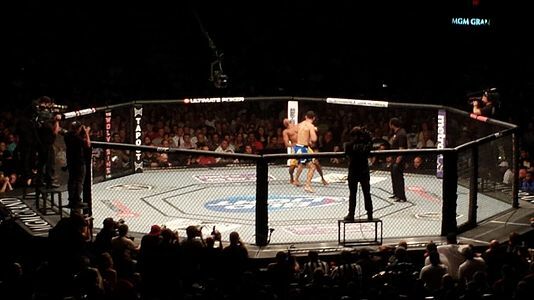 "Operators struggle again with UFC time overrun. (multiple-systems operators; Ultimate Fighting Championships)". Multichannel News. Archived from the original on October 11, 2011. Retrieved 2014-06-08– via HighBeam Research. ↑ "Jeff Blatnick's funeral and how the term MMA came to be". MMA Fighting. 2012-10-27. Archived from the original on 2014-05-02. Retrieved 2014-06-08. ↑ Eddie Goldman. "EXTREME FIGHTING 4 RULES MEETING GOES ON AS PLANNED". Archived from the original on 1998-02-03. Retrieved 2014-06-08. ↑ "Chapter 74 : Professional Shoot Fighting" (PDF). Legis.iowa.org. Archived (PDF) from the original on 2016-03-03. Retrieved 2015-06-12. ↑ Gross, Josh (2005-02-22). "MMA Vote Takes Place Today in California". Sherdog.com. Archived from the original on 2011-04-20. Retrieved 2011-05-17. 1 2 3 4 5 "Mixed Martial arts Unified Rules of Conduct". New Jersey State Athletic Control Board. September 5, 2002. Archived from the original on April 3, 2009. Retrieved 2006-06-18. ↑ "Army Embraces MMA for Inaugural Combatives Tournament". Sherdog.com. 2005-11-03. Archived from the original on 2011-06-07. Retrieved 2011-04-17. 1 2 "Members of Parliament Vote to Give MMA Legal Framework in Canada!". TopMMANews.com. 2013-06-05. Archived from the original on 2013-06-09. Retrieved 2013-06-05. ↑ "MMA Promotions Index". Tapology.com. Archived from the original on 2015-05-02. Retrieved 2015-06-12. ↑ "UFC's Dana White Talks Competition". BloodyElbow.com. 2011-04-14. Archived from the original on 2011-04-17. Retrieved 2011-04-16. ↑ "Current MMA Rankings". Fightmatrix.com. 2015-03-25. Archived from the original on 2015-06-26. Retrieved 2015-06-12. ↑ "Out of Obscurity: FNG 71, 1RC 4 and Rizin World GP 2017". CombatPress.com. Archived from the original on 27 May 2018. Retrieved 27 May 2018. ↑ "New Feeder Leagues Jockey to Be the UFC's NCAA". Vice . 11 October 2016. Archived from the original on 15 July 2018. Retrieved 1 June 2018. ↑ "'UFC puts money ahead of everything, we don't' – ACB founder Mairbek Khasiev (VIDEO)". RT (TV network) . Archived from the original on 15 July 2018. Retrieved 1 June 2018. ↑ "Rival's threat: 'we will swallow up UFC'". news.com.au . Archived from the original on 3 June 2018. Retrieved 2 June 2018. ↑ "Combat Press 2016 MMA Awards: Promotion of the Year – Absolute Championship Berkut". Combat Press. Archived from the original on 27 May 2018. Retrieved 26 May 2018. ↑ "Promo Score and Ranking". ScoreCardMMA.com. Archived from the original on 27 May 2018. Retrieved 26 May 2018. ↑ "MMA Gyms and Academies Directory". Tapology.com. Archived from the original on 2015-05-31. Retrieved 2015-06-12. ↑ "Gyms". MMATraining.com. Archived from the original on 2015-05-14. Retrieved 2015-06-12. ↑ "Alexa - Top Sites by Category: Sports/Martial Arts/Submission Fighting and MMA/News and Media". alexa.com. Archived from the original on 2015-09-14. Retrieved 2015-07-15. ↑ Sloan, Mike (June 22, 2007). "No Win Situation is Must Win for Shamrock". Sherdog, ESPN. Archived from the original on June 26, 2007. Retrieved June 22, 2007. ↑ Rousseau, Robert. "A History and Style Guide of MMA". About.com. Archived from the original on 2011-07-25. Retrieved 2011-04-20. ↑ Breen, Jordan (2009-03-11). "Art Jimmerson: Where Is He Now?". Sherdog.com. Archived from the original on 2011-11-09. Retrieved 2011-04-20. ↑ Martin, Todd (2010-08-16). "Boxing vs. MMA? More Like Boxer vs. Reality". Sherdog.com. Archived from the original on 2011-11-09. Retrieved 2011-04-20. ↑ Hunt, Loretta (2010-08-29). "White, Couture Soften Toney's Fall at UFC 118". Sherdog.com. Archived from the original on 2011-09-26. Retrieved 2011-04-20. ↑ Rossen, Jake (2010-08-31). "Respecting James Toney". Sherdog.com. Archived from the original on 2011-11-09. Retrieved 2011-04-20. 1 2 Strickland, Jonathan. "UFC History". HowStuffWorks.com. Archived from the original on 2011-01-29. Retrieved 2011-05-18. ↑ "MMA's worldwide leader in UFC news, gear and events". Mixedmartialarts.com. Archived from the original on 2014-04-13. Retrieved 2014-06-08. 1 2 Krauss, Erich (1 December 2004). Warriors of the Ultimate Fighting Championship. U.S.: Citadel Press Inc. ISBN 0-8065-2657-2. ↑ "PRIDE Rules". PRIDE FC Official Website. Archived from the original on 2014-07-09. Retrieved 2014-06-08. ↑ "RULES". ONE Official Website. Archived from the original on 2015-03-07. Retrieved 2014-06-29. ↑ "The Current Best Pound-for-Pound MMA Fighters". Tapology MMA Rankings. Archived from the original on 2014-06-18. Retrieved 2014-06-08. ↑ Jeff Wagenheim. "Jon Jones's suspension means Ronda Rousey is No. 1 in pound for pound rankings - MMA - SI.com". SI.com. Archived from the original on 2017-07-12. Retrieved 2017-12-10. ↑ "Fighter Rankings For June 1, 2014". MMARising.com. June 1, 2014. Archived from the original on May 30, 2014. Retrieved June 8, 2014. ↑ McKinley Noble. "Bellator". Bleacher Report. Archived from the original on 2014-12-22. Retrieved 2014-10-20. ↑ "The attitude of erasure - An op-ed on WMMA rankings by Fallon Fox". Bloody Elbow. Archived from the original on 2014-10-21. Retrieved 2014-10-20. ↑ "MMAWeekly World Top 10 MMA Rankings". MMAWeekly.com. 2010-10-05. Archived from the original on 2014-07-01. Retrieved 2014-06-08. ↑ "MMA Rankings". FIGHT! Magazine. Archived from the original on 2013-10-21. Retrieved 2014-06-08. ↑ "Rankings Archives". Ranking MMA. Archived from the original on 2014-05-21. Retrieved 2014-06-08. ↑ "GroundandPound . Kampfsportnews . MMA, Thaiboxen, Kickboxen, Boxen, Grappling". groundandpound.de. Archived from the original on 2010-01-18. ↑ "MMA Viking's Official Nordic Rankings – March Update". Nordic MMA Everyday at MMA Viking. Archived from the original on 2015-04-15. Retrieved 2015-04-12. ↑ "Rules and Regulations - Unified Rules and Other MMA Regulations". Archived from the original on 2016-04-16. Retrieved 2014-07-08. ↑ "UFC® Martial Arts Styles - Fighters Train in Multiple Disciplines". ufc.com. Archived from the original on 2015-03-03. Retrieved 2015-03-03. ↑ Gree, Andrew (December 20, 2005). "Kids in MMA". Innovative Martial arts. Archived from the original on July 9, 2007. Retrieved 2006-12-13. ↑ Gutierrez, Luis. "JKD and Children". One Dragon Martial arts. Archived from the original on 2007-01-02. Retrieved 2006-12-13. 1 2 "Striking Styles and Statistics, Part 1: Volume". Bloody Elbow. Archived from the original on 2014-07-27. Retrieved 2014-08-12. ↑ "FightMetric LLC :. : The World's First Comprehensive MMA Statistics Provider". Fightmetric.com. Archived from the original on 2014-08-19. Retrieved 2014-08-12. ↑ "Recipe For Success: Becoming well rounded in mixed martial arts (Part Four)". MMAmania.com. Archived from the original on 2014-07-28. Retrieved 2014-08-12. ↑ WTBA Administrator. "History". thaiboxing.com. Archived from the original on 2015-06-30. ↑ Patterson, Jeff. "Muay Thai Training". nwfighting.com. Northwest Fighting Arts. Archived from the original on 12 March 2014. Retrieved 11 March 2014. ↑ "Judo "The Gentle Way": Why Judo Is so Underrated in MMA Today". Bleacher Report . Archived from the original on 2015-01-19. Retrieved 2015-01-19. ↑ "The Gentle Way: Strikeforce Champion Ronda Rousey and the Birth of a Judo Star". Bleacher Report . Archived from the original on 2015-01-19. Retrieved 2015-01-19. ↑ "The Gentle Way Part II: Olympians Ronda Rousey and Rick Hawn Adapt to MMA". Bleacher Report . Archived from the original on 2016-03-05. Retrieved 2015-01-19. ↑ "entrevista a paulo filho (interview with Paulo Filho)" (in Portuguese). youtube.com. Archived from the original on 2016-07-02. Retrieved 2016-11-26. ↑ "Thompson champions karate in MMA, seeks UFC welterweight title". Archived from the original on 2017-03-04. Retrieved 2017-07-24. ↑ "Technique Talk: Stephen Thompson Retrofits Karate for MMA". MMA Fighting. Archived from the original on 2014-05-02. Retrieved 2014-06-08. ↑ Schneiderman, R. M. (2009-05-23). "Contender Shores Up Karate's Reputation Among U.F.C. Fans". The New York Times . Archived from the original on 2013-05-07. Retrieved 2010-01-30. ↑ "Lyoto Machida and the Revenge of Karate". Sherdog . Archived from the original on 2010-02-27. Retrieved 2010-02-13. ↑ "Chuck Liddell - Biography and Profile of Chuck Liddell". Martialarts.about.com. Archived from the original on 2012-11-19. Retrieved 2012-11-25. ↑ Jack Slack (2014-02-14). "Lyoto Machida: Old-School Karate". Bleacher Report. Archived from the original on 2014-03-14. Retrieved 2014-06-08. ↑ Wickert, Marc. "Montreal's MMA Warrior". Archived from the original on 13 June 2007. Retrieved 6 July 2007. ↑ "Taekwondo in MMA - Cage tactics - Fight! Australia magazine". Insidemma.com.au. Archived from the original on 2013-04-11. Retrieved 2016-02-29. 1 2 "5 Minutes With Anthony Pettis". FIGHT! Magazine. Archived from the original on 2014-12-13. Retrieved 2014-12-11. ↑ "Taekwondo Salto open 2010-anderson silva final -87kg(Professor Agnaldo Martins)". YouTube. Archived from the original on 2015-01-10. Retrieved 2014-12-11. ↑ Anderson Silva; Erich Krauss; Glen Cordoza (17 November 2008). The Mixed Martial Arts Instruction Manual: Striking. Victory Belt Publishing. ISBN 978-0-9815044-1-4. Archived from the original on 5 January 2016. Retrieved 17 November 2015. ↑ "Realer Sports w/ Rosenberg: UFC Champ Anthony Pettis". YouTube. Archived from the original on 2014-12-07. Retrieved 2014-12-11. ↑ Grant, T. P. (6 February 2014). "BE Open Mat: Sambo Fighter Success". Bloody Elbow. Archived from the original on 21 January 2019. Retrieved 21 January 2019. ↑ Beacham, Greg (2010-09-29). "Zhang hoping to lead Chinese wave into MMA". USA Today . Archived from the original on 2010-10-19. Retrieved 2010-11-25. ↑ "UFC potpisao nevjerojatno atraktivnog dagestanskog kung fu nokautera (VIDEO)". Fight Site (in Croatian). Archived from the original on 2019-02-15. Retrieved 2019-02-15. ↑ Snowden, Jonathan. "Learn the Name: Zabit Magomedsharipov Has the Tools to Be a UFC Star". Bleacher Report. Archived from the original on 2019-02-15. Retrieved 2019-02-15. ↑ Jonathan Snowden; Kendall Shields (1 November 2010). The MMA Encyclopedia. ECW Press. p. 961. ISBN 978-1-55490-844-8. Archived from the original on 5 January 2016. Retrieved 17 November 2015. ↑ UFC 160 Judo Chop: The Best and Worst of Junior Dos Santos Archived 2013-07-15 at the Wayback Machine "...Cigano's sprawl and brawl is a true throwback to the early days of MMA, when men like Chuck Liddell, Wanderlei Silva, Rampage Jackson, and Mirko Cro Cop...". Bloodyelbow.com. Retrieved July 16, 2013. ↑ Ruebusch, Connor (11 March 2015). "UFC 185 Judo Chop - Joanna Jedrzejczyk: Payback and Fighting Dirty". SB Nation (BloodyElbow.com). Archived from the original on 12 August 2016. Retrieved 12 July 2016. ↑ "UFC 10: Birth of ground 'n' pound is also well known for his ground and pound, as is Fedor Emelianenko". Yahoo. Archived from the original on 2012-01-26. Retrieved 2010-01-19. ↑ Andrew Richardson. "UFC 160 complete fighter breakdown, Cain Velasquez edition". MMAmania.com. Archived from the original on 2013-10-05. Retrieved 2013-07-19. ↑ OBI, NEDU (December 12, 2011). UFC 140 Results: Tito Ortiz and the 5 Best Ground-and-Pound Artists Eve Archived 2014-05-17 at the Wayback Machine "..."The Emperor," fallen though he might be of late, takes the No. 1 spot as the greatest ground-and-pound artist in MMA history...". bleacher Report . Retrieved June 19, 2013. ↑ Slack, Jack (June 04, 2012). Analyzing Fedor: Revolutionizing Ground And Pound Archived 2014-01-22 at the Wayback Machine "...What Fedor will always be remembered for by fans who saw him compete in his prime, however, was his revolutionizing of ground and pound...". bloodyelbow.com. Retrieved June 19, 2013. 1 2 Correspondent (2008-11-22). "The Ultimate Takedown Championship? Ways to End Lay and Pray". Bleacher Report. Archived from the original on 2013-10-23. Retrieved 2014-08-12. ↑ Featured Columnist (2010-11-02). "MMA: The Falsities of Lay and Pray". Bleacher Report. Archived from the original on 2013-10-23. Retrieved 2014-08-12. ↑ Analyst (2009-11-08). ""How I Mastered the Art of Lay-and-Pray" by Jake Shields". Bleacher Report. Archived from the original on 2013-10-23. Retrieved 2014-08-12. ↑ "Judges need to punish lay-and-pray tactics - Hardy | UFC News". ESPN.co.uk. 2010-09-07. Archived from the original on 2014-08-26. Retrieved 2014-08-12. ↑ Contributor (2011-07-22). "UFC and Jon Fitch: 5 Reasons Why the Jon Fitch Issue Is the Most Toxic in MMA". Bleacher Report. Archived from the original on 2013-10-23. Retrieved 2014-08-12. ↑ "Rashad Evans Follows Georges St Pierre Down the Boring Road to Victory". Bloody Elbow. Archived from the original on 2014-08-22. Retrieved 2014-08-12. ↑ "UFC Fighting Styles". Zewkey.com. Archived from the original on 2013-05-29. Retrieved 2014-08-12. ↑ "UFC Dream Match: Jacare Souza vs. Demian Maia". 23 May 2016. Archived from the original on 7 November 2017. Retrieved 3 November 2017. ↑ "FCF - Mixed Martial Arts Council UFC Rules update 6/99". Fcfighter.com. Archived from the original on 2014-03-28. Retrieved 2014-08-12. ↑ Marrocco, Steven (Feb 22, 2013). UFC 157 preview: How can Liz Carmouche beat heavy favorite Ronda Rousey? Archived 2013-07-06 at the Wayback Machine "...While Rousey is generally a master at initiating throws from the clinch to set up armbars...". MMAjunkie.com . Retrieved July 16, 2013. ↑ Slack, Jack (March 29, 2013). Best of the Best: Anderson Silva's Muay Thai Clinch Work Archived 2013-04-02 at the Wayback Machine "...This is truly the difference between fighters who flail to grab a hold of their opponents head and try to knee, and someone like Silva who will set up his grips scientifically...". Bleacher Report . Retrieved July 16, 2013. ↑ Sllack, Jack (January 04, 2013). Randy Couture Judo Chop: Boxing into the Clinch Archived 2014-01-22 at the Wayback Machine "...The first major exponent of Greco-Roman wrestling in MMA, Randy Couture remains one of the few fighters to make full use of opportunities to clinch and the damage which can be done to the opponent from there...". bloodyelbow.com. Retrieved July 16, 2013. ↑ "Khabib Nurmagomedov vs. Pat Healy set for UFC 165 in Toronto". MMAmania.com. Archived from the original on 2013-10-15. Retrieved 2014-06-08. ↑ Fowlkes, Ben (August 17, 2013). "UFC Fight Night: Sonnen submits Rua in first round". USA Today. Archived from the original on July 11, 2017. Retrieved September 5, 2017. ↑ Sherdog.com (2008-10-08). "Valkyrie Takes Flight Nov. 8". Sherdog.com. Archived from the original on 2008-12-08. Retrieved 2009-09-12. ↑ "Bleacher Report". Bleacher Report. 2010-01-14. Archived from the original on 2012-10-27. Retrieved 2012-11-25. ↑ Fowlkes, Ben. "Zuffa-Strikeforce Deal Could Mean Uncertain Future for Women's MMA". MMA Fighting. Archived from the original on 2012-06-06. Retrieved 2012-11-25. ↑ "canada.com - Blogs". Communities.canada.com. 2012-11-20. Archived from the original on 2012-07-09. Retrieved 2012-11-25. ↑ "Is This the End of Women's MMA?". Bleacher Report. 2009-08-16. Archived from the original on 2012-10-11. Retrieved 2012-11-25. ↑ "Power Rankings: MMA, UFC's 10 biggest draw cards from Conor McGregor to Ronda Rousey based on star power - Fox Sports". www.foxsports.com.au. Archived from the original on 2018-05-15. Retrieved 2018-05-15. ↑ Sean Gregory, Should A Former Man Be Able To Fight Women? Archived 2014-09-24 at the Wayback Machine , Time magazine, 24 May 2013. ↑ Brynn Tannehill, Fallon Fox and the Legacy of Satchel Paige Archived 2015-01-04 at the Wayback Machine , Huffington Post, 16 December 2014. ↑ "Rules | IMMAF – International Mixed Martial Arts Federation". Immaf.org. Archived from the original on 2014-07-07. Retrieved 2014-08-12. ↑ "MMA's rival governing bodies amalgamate, with GAISF in sight - Featured News- News - Sportcal". www.sportcal.com. Archived from the original on 2018-05-13. Retrieved 2018-05-13. ↑ "Ошибка: обслуживание сайта было приостановлено". Wmmaa.org. Archived from the original on 2014-09-10. Retrieved 2014-08-12. ↑ Export Strategy Dublin Ireland (2013-05-23). "Vadim Finkelstein on UFC in Sweden, Dana White, M-1 Challenge 38 & Emelianenko brothers - All about Mixed Martial Arts". Combatbear.com. Archived from the original on 2014-08-26. Retrieved 2014-08-12. ↑ "Грязная политика". Mixfight.ru. Archived from the original on 2014-07-21. Retrieved 2014-08-12. ↑ "M-1 Global намерена организовать поединок Емельяненко — Веласкес в Москве - Чемпионат". Championat.com. Archived from the original on 2014-09-01. Retrieved 2014-08-12. ↑ Super User. "Members - World Mixed Martial Arts Association - We are the future of MMA". World Mixed Martial Arts Association - We are the future of MMA. Archived from the original on 2013-10-15. Retrieved 2013-12-16. ↑ "Press-release: 2013 World MMA Championship results and video". Archived from the original on May 2, 2014. Retrieved December 16, 2013. ↑ "International MMA Federation founded". Archived from the original on May 20, 2013. Retrieved April 12, 2010. ↑ "UFC Supports Creation of International MMA Federation". UFC. Archived from the original on 5 February 2015. Retrieved 22 April 2015. ↑ "UFC backs creation of International Mixed Martial Arts Federation (IMMAF)". MMAmania.com. Archived from the original on 6 January 2015. Retrieved 22 April 2015. ↑ "IMMAF Statutes 29 February 2012" (PDF). Immaf.org. Archived (PDF) from the original on 24 September 2015. Retrieved 12 June 2015. 1 2 3 4 5 "Members". IMMAF - International Mixed Martial Arts Federation. Archived from the original on 2015-03-16. ↑ "IMMAF Launches World Championships". Reuters. 2013-05-24. Archived from the original on 2015-11-23. ↑ "IMMAF World Championships : Las Vegas 2014". Immaf.org. Archived from the original on 2015-07-30. Retrieved 2015-06-12. ↑ "First Amateur MMA World Championships To Be Held in the USA". MMA Platinum Gloves. Archived from the original on 2016-03-04. Retrieved 2014-01-22. 1 2 3 4 Lystad, Reidar P.; Kobi Gregory; Juno Wilson (2014). "The epidemiology of injuries in mixed martial arts: A systematic review and meta-analysis". Orthopaedic Journal of Sports Medicine. 2 (1): 2325967113518492. doi:10.1177/2325967113518492. Archived from the original on 2014-05-21. Retrieved 2014-03-15. ↑ Frey, A.; D. Rousseau; B. Vesselle; Y. Hervouet des Forges; M. Egoumendes (2004). "Neuf saisons de surveillance médicale de compétitions de judo: une analyse nationale de la traumatologie du judo en compétition". J Traumatologie Sport. 21 (2): 100–109. doi:10.1016/s0762-915x(04)97390-1. ↑ Lystad, Reidar P.; Henry Pollar; Petra L. Graham (2009). "Epidemiology of injuries in competition taekwondo: a meta-analysis of observational studies". Journal of Science and Medicine in Sport. 12 (6): 614–621. doi:10.1016/j.jsams.2008.09.013. PMID 19054714. ↑ Estwanik, J.J.; M. Boitano; N. Ari (1984). "Amateur boxing injuries at the 1981 and 1982 USA/ABF national championships". Phys Sportsmed. 11: 123–128. ↑ Bledsoe, G.H. ; G. Li; F. Levy (2005). "Injury risk in professional boxing". South Med J. 98 (10): 994–998. doi:10.1097/01.smj.0000182498.19288.e2. PMID 16295814. ↑ Zazryn, T.R. ; C.F. Finch; P. McCrory (2003). "A 16 year study of injuries to professional boxers in the state of Victoria, Australia". Br J Sports Med. 37 (4): 321–324. doi:10.1136/bjsm.37.4.321. PMC 1724673 . PMID 12893717. ↑ Zazryn, T.R. ; P. Cameron; P. McCrory (2006). "A prospective cohort study of injury in amateur and professional boxing". Br J Sports Med. 40 (8): 670–674. doi:10.1136/bjsm.2006.025924. PMC 2579447 . PMID 16807306. ↑ Zazryn, T.R. ; P. McCrory; P. Cameron (2006). "Injury rates and risk factors in competitive professional boxing". Clin J Sports Med. 19: 20–25. ↑ Roy, Soham; Smith, Lee P. (January 2010). "A novel technique for treating auricular hematomas in mixed martial artists (ultimate fighters)". American Journal of Otolaryngology. 31 (1): 21–24. doi:10.1016/j.amjoto.2008.09.005. ISSN 0196-0709. Archived from the original on 2018-11-15. Retrieved 2018-11-14. ↑ "A Third Fatality for Modern Mixed Martial Arts | Martial History Magazine". Martialhistory.com. Archived from the original on 2013-06-09. Retrieved 2012-11-25. 1 2 Sievert, Steve (2007-11-26). "Mixed Martial Arts Notebook: Vasquez in toughest fight". Houston Chronicle. Archived from the original on 2007-12-19. Retrieved 2007-12-02. 1 2 "Update: Sam Vasquez Dead at 35". Sherdog.com. 2007-12-02. Archived from the original on 2013-03-20. Retrieved 2013-02-13. ↑ "Fighter Dies in South Carolina After First Pro Bout". Sherdog.com. June 28, 2010. Archived from the original on July 1, 2010. Retrieved June 28, 2010. ↑ "Tyrone Mims, MMA Fighter, Dies Following Amateur Bout in South Carolina". MMA Fighting. Archived from the original on 2017-08-26. Retrieved 2017-11-29. ↑ "Final autopsy results inconclusive on South Carolina MMA fighter following August death". MMAjunkie. 2012-11-09. Archived from the original on 2017-12-01. Retrieved 2017-11-29. ↑ "EFC Africa fighter Booto Guylain dies from injuries suffered in February bout". MMAjunkie. 2014-03-05. Archived from the original on 2017-12-01. Retrieved 2017-11-29. ↑ "Pro MMA Ffghter Booto Guylain dies after bout in South Africa". NY Daily News. Archived from the original on 2017-05-16. Retrieved 2017-11-29. ↑ "Portuguese MMA fighter João Carvalho dies after TKO in Dublin". 2016-04-12. Archived from the original on 2017-12-22. Retrieved 2017-12-20. ↑ "Amateur MMA fighter Donshay White dies in Louisville after collapsing in locker room". MMAjunkie. 2017-07-17. Archived from the original on 2017-12-01. Retrieved 2017-11-29. ↑ Corsey, Gil. "No drugs and no foul play involved in MMA fighter death in Louisville". Archived from the original on 2017-12-01. Retrieved 2017-11-29. ↑ "Victoria needs the 'cage' to lure UFC". 10 October 2013. Archived from the original on 3 January 2014. Retrieved 3 December 2013. ↑ Savage, Alison (3 March 2015). "MMA cage fighting: Victorian Government to lift ban on octagon". ABC.net.au. Archived from the original on 7 March 2015. Retrieved 4 March 2015. ↑ Duane Finley (2015-08-20). "The Fighting Life: The Rise of MMA in Bahrain". Bleacher Report. Archived from the original on 2017-02-23. Retrieved 2017-03-23. ↑ "Brave To Host 9 Events in Middle East in 2017; UAE to Have An Edition in March". ArabsMMA. 2014-06-20. Archived from the original on 2017-02-23. Retrieved 2017-03-23. ↑ "Bahrain News Agency | Bahrain to host World MMA Amateurs Championship2017". Bna.bh. Archived from the original on 2017-02-23. Retrieved 2017-03-23. ↑ "Brazilian MMA Athletic Commission joins IMMAF regulatory group". MMAjunkie. Archived from the original on 2014-02-02. Retrieved 2014-01-22. ↑ "Brazil Establishes New MMA Regulatory Commission, Joins IMMAF". 411MANIA.com. 2013-01-17. Archived from the original on 2014-05-02. Retrieved 2015-06-12. ↑ "UFC on FX 7 - Belfort vs. Bisping". Sherdog.com. 2013-01-19. Archived from the original on 2015-06-09. Retrieved 2015-06-12. ↑ "Brazilian commission suspends Rousimar Palhares for 120 days". MMA Fighting. Archived from the original on 2013-10-15. Retrieved 2014-01-22. ↑ "CABMMA suspends Rousimar Palhares 120 days following UFC Fight Night 29". MMAjunkie. Archived from the original on 2013-12-08. Retrieved 2014-01-22. ↑ "Brazil medical commissioner defends Belfort's TRT - Fighters Only". Archived from the original on 2014-05-03. ↑ Paul Quigley. "Bulgaria joins the IMMAF - Fighters Only". Archived from the original on 2014-12-04. ↑ "IMMAF WELCOMES THE BULGARIAN FEDERATION OF MMA". Sherdog. Archived from the original on 2014-11-10. Retrieved 2014-11-10. ↑ "Criminal Code". Laws-lois.justice.gc.ca. Archived from the original on 2012-10-10. Retrieved 2012-11-25. 1 2 Magraken, Erik. "Now That We're Done Celebrating Bill S-209, Time to Get To Work". CanadianMMALawBlog.com. Archived from the original on 2 July 2013. Retrieved 16 July 2013. ↑ "Ontario joins list of provinces to allow mixed martial arts". Shaw Communications Inc. August 16, 2010. Archived from the original on July 23, 2011. Retrieved November 16, 2010. 1 2 "Mixed Martial Arts Regulation in North America" (PDF). January 22, 2010. Archived (PDF) from the original on September 17, 2010. Retrieved September 10, 2010. 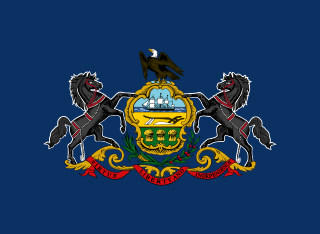 ↑ "States for Kickboxing or MMA". International Sport Combat Federation. July 13, 2010. Archived from the original on December 12, 2010. Retrieved September 10, 2010. 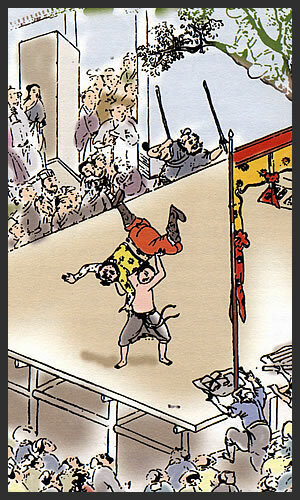 ↑ "RUFF new combat sport to contend with China's traditional martial arts". Archived from the original on 2012-12-19. ↑ "DMMA - Danish Mixed Martial Arts Federation". Dmmaf.dk. Archived from the original on 2015-06-29. Retrieved 2015-06-12. ↑ Kyle Symes. "France's Sports Ministry Says Non Merci to UFC, Upholds Ban on MMA". Bleacher Report. Archived from the original on 2014-12-25. Retrieved 2014-11-10. ↑ "- THE LEGALIZATION OF MMA IN FRANCE - MMAWeekly.com". MMAWeekly.com. Archived from the original on 2014-11-10. Retrieved 2014-11-10. ↑ "Despite UFC Lobbying Efforts, France Upholds Ban on Mixed Martial Arts - MMAWeekly.com". MMAWeekly.com. Archived from the original on 2014-11-10. Retrieved 2014-11-10. ↑ "100% FIGHT". Facebook. Archived from the original on 2015-10-17. Retrieved 2014-11-10. 1 2 "Commission nationale de Mixed Martials Arts". Website-Modern. Archived from the original on 2014-11-10. Retrieved 2014-11-10. ↑ "French MMA commission joins International Mixed Martial Arts Federation". MMAjunkie. Archived from the original on 2014-11-10. Retrieved 2014-11-10. ↑ "411MANIA - French MMA Commission Joins International Mixed Martial Arts Federation". French MMA Commission Joins International Mixed Martial Arts Federation. Archived from the original on 2014-11-10. ↑ "All India Mixed Martial Arts Association". aimmaa.org. Archived from the original on 2018-02-06. Retrieved 2018-02-15. ↑ "Super Fight League". www.facebook.com. ↑ "Recap of the first AIMMAA Sanctioned MMA Event In North East India: JFL #1". 12 June 2016. Archived from the original on 16 February 2018. Retrieved 15 February 2018. ↑ "AIMMAA's national amateur event creates history in the Indian MMA world". 8 October 2016. Archived from the original on 16 February 2018. Retrieved 15 February 2018. ↑ Nadvertex. "Delhi Open International MMA Championships 2015 – IMMAF". www.immaf.org. Archived from the original on 2018-02-16. Retrieved 2018-02-15. ↑ Nadvertex. "Sport MMA introduced into Indian Schools & Colleges Programme – Sports For All – IMMAF". www.immaf.org. Archived from the original on 2018-02-16. Retrieved 2018-02-15. ↑ "IMAC Structure". Irish Martial Arts Commission. 15 June 2011. Archived from the original on 22 December 2015. Retrieved 19 December 2015. ↑ "Martial Arts". Governing Bodies: NGB Sports Investment. Irish Sports Council. Archived from the original on 5 January 2016. Retrieved 19 December 2015. ↑ "Senator backtracks on call to ban Conor McGregor's Dublin title fight after fan outcry". Independent.ie. 1 2 "Irish federation gets full political support". IMMAF. 18 March 2013. Archived from the original on 8 July 2014. Retrieved 19 December 2015. ↑ "MMA Promotions and Organizations List - Pro and Small | MMA Styles, History, Strategies, and Facts". Mmawild.com. Archived from the original on 2012-11-20. Retrieved 2012-11-25. ↑ "ＥＤがもっともかかりやすい生活習慣病といわれる理由". Hero-s.com. Archived from the original on 2012-12-08. Retrieved 2012-11-25. ↑ "IMMAF Regulation Around The World: Update". MMA Uncaged. Archived from the original on 2014-11-10. Retrieved 2014-11-10. ↑ "Press Release From MASMMAA". Archived from the original on 2014-11-10. ↑ "Knockouts Aren't Allowed in Norwegian MMA". Fightland. Archived from the original on 2014-02-19. Retrieved 2014-01-22. ↑ "Nordic MMA Overview". Nordic MMA Everyday at MMA Viking. Archived from the original on 2014-02-01. Retrieved 2014-01-22. ↑ "NMMAF Merkekamper". Archived from the original on 2014-02-01. Retrieved 2014-01-22. ↑ "FMMAP - Federação de Mixed Martial Arts de Portugal". Archived from the original on 2014-10-18. ↑ "RMMAF - Zi importanta pentru comunitatea de MMA din Romania - RMMAF". RMMAF. Archived from the original on 2014-11-10. Retrieved 2014-11-10. ↑ "RMMAF a definitivat lotul Romaniei pentru Mondialele din Las Vegas". www.natiuneamma.ro. Archived from the original on 2014-11-10. Retrieved 2014-11-10. ↑ "Fedor Emelianenko Now President Of Russian MMA Union". Fightline.com. Archived from the original on 2013-01-17. ↑ Leidecker, Tim (May 31, 2007). "European Throwdown: Notes From Iberia to Siberia". Sherdog.com. Archived from the original on November 9, 2011. Retrieved May 23, 2011. ↑ O'Leary, Ryan (February 10, 2011). "Sweden Closer to Hosting UFC". Sherdog.com. Archived from the original on February 14, 2011. Retrieved May 23, 2011. 1 2 3 O'Leary, Ryan. "Bright Lights in Sweden's Dark November". Sherdog.com. Archived from the original on August 23, 2011. Retrieved May 23, 2011. ↑ O'Leary, Ryan (April 14, 2011). "Unified Rules Adopted for Superior Challenge 7". Sherdog.com. Archived from the original on April 18, 2011. Retrieved May 23, 2011. ↑ "International MMA Federation launches in Sweden, expected to receive UFC backing". MMAjunkie. Archived from the original on 2014-02-01. Retrieved 2014-01-22. ↑ "Swedish MMA Federation rules Alexander Gustafsson medically unfit for UFC on FUEL 9 main event". MMA Fighting. Archived from the original on 2014-05-02. Retrieved 2014-01-22. ↑ "SMMAF rules against Alexander Gustafsson; 'Mauler' medically unfit to compete at UFC on FUEL TV 9". MMAmania.com. Archived from the original on 2014-05-08. Retrieved 2014-01-22. ↑ "Bleacher Report". Bleacher Report. Archived from the original on 2014-05-08. ↑ "SMMAF issues statement on Alexander Gustafsson's removal from UFC on Fuel 9". Bloody Elbow. Archived from the original on 2014-05-08. Retrieved 2014-01-22. ↑ "UMF Muaythai & Dragon Legends MMA 'Underground' Fight Night", My City by Night, Cape Town, 10 May 2012. Retrieved on 21 October 2013. ↑ Kittipong Thongsombat (2012-03-31). "Thailand bans mixed martial arts". Bangkok Post. p. S6. SAT officials met this week to discuss whether holding an MMA event was lawful or not following a request from a private company and they finally agreed that under the 1999 boxing law, it is unlawful to stage an MMA event in Thailand. "Organising a MMA event here would hurt the image of Muay Thai," Sakol Wannapong said. ↑ "THAILAND GOVERNMENT BANS MMA". FightersOnlyMag.com. September 27, 2012. Archived from the original on March 31, 2012. Retrieved March 29, 2012. ↑ "Legal grey: DARE Championship defying Thailand's ban on MMA". mmafighting.com. September 27, 2012. Archived from the original on December 4, 2012. Retrieved March 29, 2012. ↑ "Universalcombatnews.com". Archived from the original on 14 June 2015. Retrieved 12 June 2015. ↑ "ABC Boxing - Association of Boxing Commissions - United States - Canada - Puerto Rico - US Virgin Islands". Archived from the original on 2014-02-02. ↑ "West Virginia becomes 45th state to regulate mixed martial arts". MMAJunkie.com. 2011-03-24. Archived from the original on 2011-08-23. ↑ "Wyoming becomes state No. 46 to regulate MMA". MMAJunkie.com. 2012-03-12. Archived from the original on 2012-03-15. Retrieved 2012-03-12. ↑ "Vermont becomes state No. 46 to regulate MMA". MMAJunkie.com. 2012-05-04. Archived from the original on 2012-05-08. Retrieved 2012-05-04. ↑ "Conn. gov signs bill legalizing mixed martial arts". Seattle Post-Intelligencer . 11 July 2013. Archived from the original on 13 July 2013. Retrieved 12 July 2013. ↑ "NY clears way to allowing professional mixed martial arts - Yahoo Sports". Sports.yahoo.com. 2016-03-22. Archived from the original on 2016-04-04. Retrieved 2016-04-02. ↑ Cruz, Jason (14 April 2016). "Governor Cuomo signs NY MMA Bill into law; UFC announces event at MSG November 12th". MMAPayout.com. Archived from the original on 23 April 2016. Retrieved 14 April 2016.